Mary knew she needed to do something about her failing knees, but she didn’t know that she would receive one of the first knee replacements of it’s kind. Mary’s knees had started bothering her about three years ago, but the pain had gotten progressively worse recently. She decided it was time to take action when everyday tasks started to become almost unbearable. “If I went grocery shopping, by the time I got out to the car, my knees were killing me and I was struggling just to get into the car,” Mary described. She was soon scheduled to have her surgery done at St. Cloud Surgical Center by Dr. Eric Green of St. Cloud Orthopedics. The morning of her surgery, Dr. Green received a call from the global medical technology company, Smith and Nephew. They had chosen Dr. Green and the St. 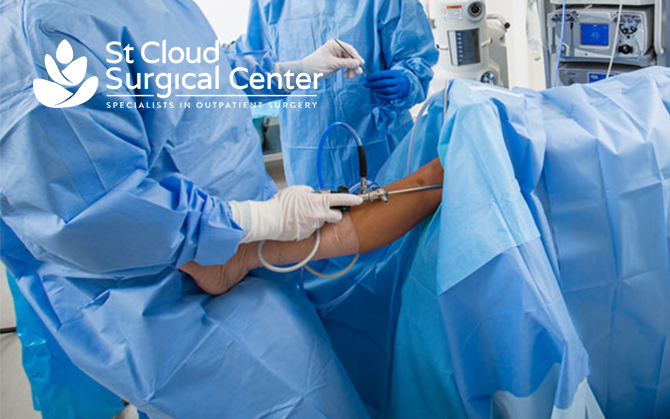 Cloud Surgical Center to perform one of the first surgeries utilizing robotic assistance in conjunction with their newly developed Journey II XR Total Knee System, a bi-cruciate retaining knee system that preserves the ACL and PCL. Usually, full knee replacements involve sacrificing the Anterior Cruciate Ligament (ACL) and then optionally sacrificing the Posterior Cruciate Ligament (PCL). The Journey II XR knee is the only type of knee commercially available in the United States that preserves both of these main stabilizing ligaments. Dr. Green performed the surgery using Navio robotic-assisted technology. This revolutionary technology allows surgeons greater intraoperative planning, as well as greater accuracy and precision during surgery. There have been less than 100 Journey II XR full knee replacement surgeries done with robotic assistance worldwide. Because Dr. Green was able to preserve the ACL instead of sacrificing it, Mary experienced a better recovery and a more natural and normal feeling knee post-surgery. The Smith and Nephew Journey II XR Total Knee System addresses patients’ ever-growing expectation to return to an active lifestyle. A large part of her success comes from her willingness to put in the work during her recovery. “Some people want to have an operation and then just sit back and let it happen. Patients being motivated to work on their recovery is a crucial factor,” said Dr. Green. Although joint replacement always involves a long recovery process, Mary has already seen incredible improvements. She is able to get in and out of chairs much easier and is walking up and down steps with virtually no pain. “What I can do with this knee now compared to before the surgery is phenomenal,” said Mary.